This is the most crucial difference between the way B2B and B2C customers will respond to your email. Business customers are more likely to want the facts – high quality information and a unique insight into an area they’re interested in. They want value, and content that appeals to their logical, reason-based thinking. B2C recipients, meanwhile, are more likely to react in an emotional way to your email campaign. You need to provoke this emotional response with engaging, entertaining content if you want them to buy, and it needs to happen instantly. 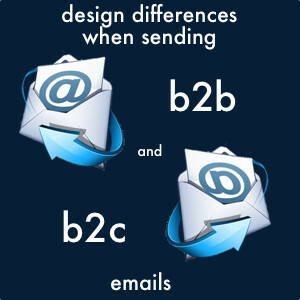 The design of emails for B2C customers is crucial to the success of the marketing campaign. The focus of the email needs to be on the ‘quick to click’ call to action. You should aim to engage the recipient with a short, strong message and an entertaining, humorous or fun piece of content – videos and images are a good choice for this. Keep your email snappy and to the point, and don’t be afraid to be bright, bold and colorful. Remember – you’re aiming for an emotional response and an instant decision to click through. More formal in tone, but they still need to be compelling and engaging – don’t send your audience to sleep! Remember, while B2C emails are aiming for an instant reaction or sale, B2B campaigns are more far-reaching in scope. The focus is more on lead generation and nurturing, so your email may only be the first stage in a longer game. While there are undoubtedly differences between B2B and B2C email marketing campaigns, both of these very different audiences have a few things in common. Firstly, both like a sense of added value – special offers, discounts and deals. These are the ‘hooks’ that will get your emails opened in the first place. Secondly, both like to read emails on the go, so it’s crucial to make sure your emails have a responsive design that is optimised for mobile devices.